A few weeks ago I popped in to my local shop to get food for supper. There was a woman in the store, pushing a baby pram, answering a lot of questions from one little girl, while trying to keep the two other girls with her while she shopped. I really admired her patience with all the questions, and because the girls were all over the show. She and I got talking after I overheard her saying she was on her way to fetch her son from school. I could not help but ask her how many kids she had! 4 with her and at least one at school meant 5 kids, and that’s a handful. Turns out that only 2 of the girls were hers, and the other little girl was her god daughter. The baby was a child she was fostering. She and her husband take on orphaned and abandoned children until they are adopted. She had the tiniest 9 week old baby with her who was being placed with her forever parents the following week. I asked her if her heart broke a little each time she said goodbye to a baby and she told me no matter how hard it was, the nurturing of these children gave her far much more. And I really admire her, and am in awe of how adaptable her children must be to this flux in their lives. Change is not something I go out and look for. But, I had to adapt my pickled cucumber recipe as a set of circumstances arose which necessitated this. I must say, I am quite glad, as the new recipe is so much better than the old one, and these are the crunchiest pickled cucumbers I have ever made. These are the crunchiest pickled cucumbers ever! These will keep in the fridge for as long as you can resist eating them. Wow what a woman indeed! She sounds like she has a big heart to take care of so many. Hehe I love Anna’s comment above! Thank goodness for such kind hearted individuals that are taking these foster children in to help them get a better life. Now I know if I had more of your delicious pickled cucumbers in our lives we would be very happy. Take care and have a super weekend! What a well-written post Tandy! I love the way you brought it full-circle and I love that you don’t put sugar in your pickles. You have to admire a woman like that! Children seem so adaptable to me as well, why do we loose that skill as we age? I don’t even like switching toothpastes. Yet children are so accepting of everyone they meet. I’m always amazed at how my girls accept and smile at almost every new person they meet without hesitation. I certainly can’t do that! Anyhow, these pickled cucumbers seem fantastic and I already know they would be a huge hit with my family. Time to experiment! I really do admire her a lot Laura! I love pickles – they look and sound terrific! Wow, I totally admire that woman you met at the store! I’m not sure I could be a foster parent, I get attached way to easily! Anyways, pickled anything is always delicious, but homemade pickled cucumbers? Delish! Yours look terrific! Cheers and thanks for sharing the YUM! That lady’s compassionate heart is indeed inspiring – such a sweet story Tandy – thanks for sharing that and the recipe for these pickled cucumbers! My daughter is forever asking me to pickle cucumbers and now I can! That is amazing!! That woman has a lot of heart. I love love love pickled cucumbers! This pickling recipe sounds like it makes for some great pickles. I love that the child will have a “forever mum”! Thanks also for sharing the recipe, I have so many cucumbers at the moment, these look delicious. 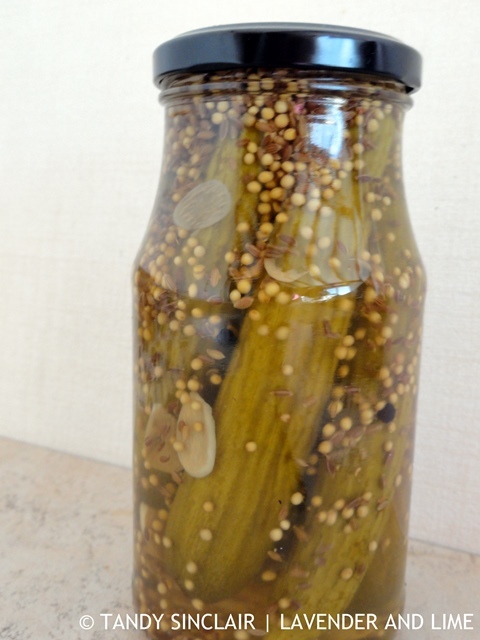 I love crunchy crunchy gherkin – great recipe Tandy. Oh, I do admire people like that – taking on kids that they aren’t going to be able to see through. These cucumbers certainly look fab – Tandy.